Florida and summer are equal to daily showers and thunderstorms which can be a challenge when trying to have some summertime fun in the sunny state. 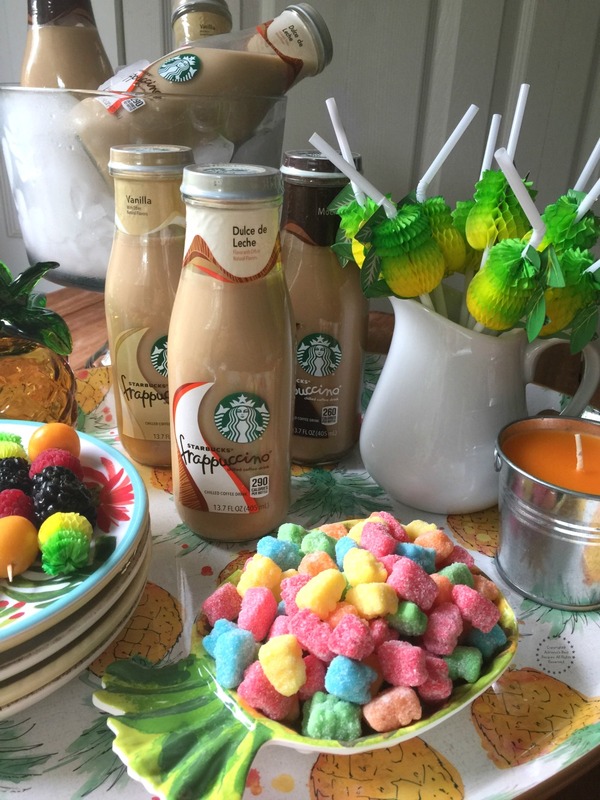 Throwing a tropical indoor picnic with las amigas is in order to enjoy a good chatter and spend time together while sipping yummy Frappuccino® and eating sweet treats. The other day while shopping at the supermarket I found the NEW Starbucks® Bottled Frappuccino® Dulce De Leche flavor. This coffee drink is available at Walmart. Visit Walmart.com/starbuckssummer or click on the picture for details. Take advantage of this Starbucks® Rewards offer for Walmart shoppers > Buy 3 Ready to Drink Products and get 35 stars” (In-store only, receipt verification). While at the store I bought Starbucks® Bottled Dulce de Leche Frappuccino® Coffee Drink 13.7 oz, as well as Starbucks® Bottled Frappuccino® Mocha and Vanilla. 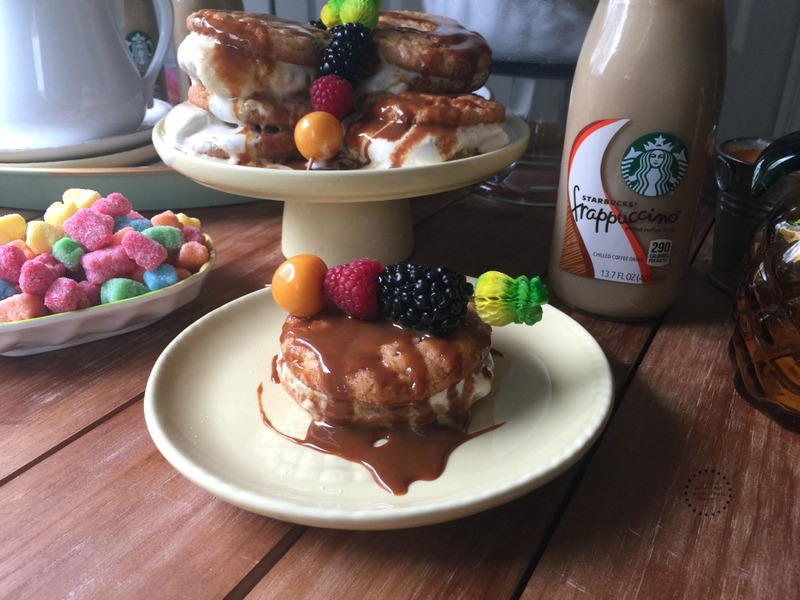 Being a dulce de leche and Starbucks® fan thought this new coffee drink would be excellent to serve on an upcoming tropical indoor picnic with my BFFs. Because it is convenient as it comes in a glass bottle with a pop of cap. Making it easy to drink directly from the bottle without having to pour. Which in my world of entertaining at home means less things to clean after the indoor picnic is over. Plus the flavor of the Starbucks® Bottled Frappuccino® Dulce De Leche is fantastic. I love a tasty cold coffee drink in the afternoon. Specially when the weather is hot despite the rain. It is amazing how refreshing and enjoyable a cold coffee can be. An uplifting sensation indeed. I know I cannot live without my daily cafecito so having a product that is ready to enjoy is what I call a sippable moment for a summertime sunny state of mind. Every summer I invite my best friends to come over to my home so that we can have some time together and relax. When entertaining at home I like to be creative and think of themes and menus that my guests will enjoy. And a themed tropical indoor picnic I thought was suitable for this year’s get-together. 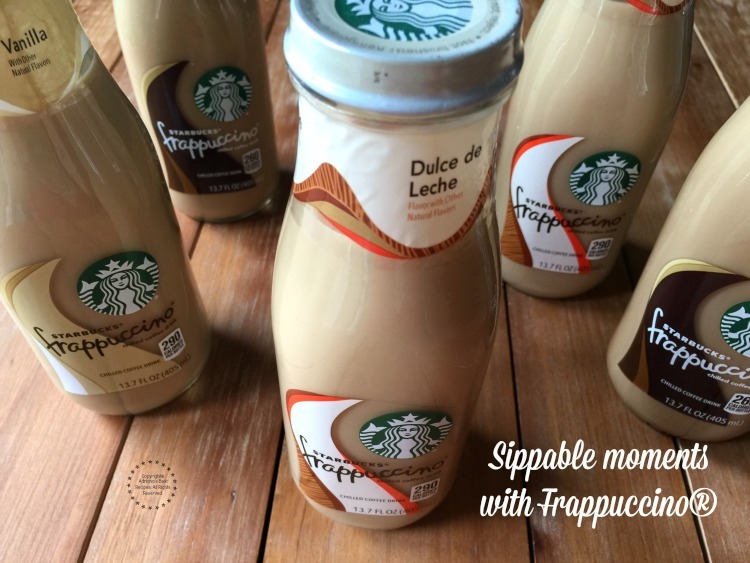 Shop at Walmart for Starbucks® Bottled Dulce de Leche Frappuccino® Coffee Drink 13.7 oz. While at the store buy cookies, dulce de leche and ice cream for making ice cream sandwiches. Plus gummy candy and fresh fruits. 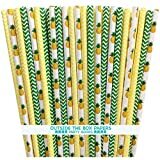 Shop for decorative tropical straws and medium size pineapple picks to make fruit kabobs. 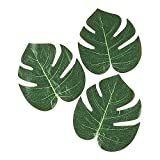 As well as napkins, candles and other decorative elements to enhance the picnic party environment. Use a pineapple themed tray and plates, as well as a cheerful color palette appropriate for a girls indoor picnic. On your table set up place a big bowl with ice and add the Starbucks® Bottled Dulce de Leche Frappuccino® Coffee Drinks to serve them cold. Have fun and celebrate friendship and good times while creating everlasting memories with those gals that you consider your hermanas. Watch the video to see how easy it is to put together a quick indoor picnic at home. For more information about Starbucks® Bottled Dulce de Leche Frappuccino® Coffee Drink 13.7 oz visit http://frappuccino.com/bottled. 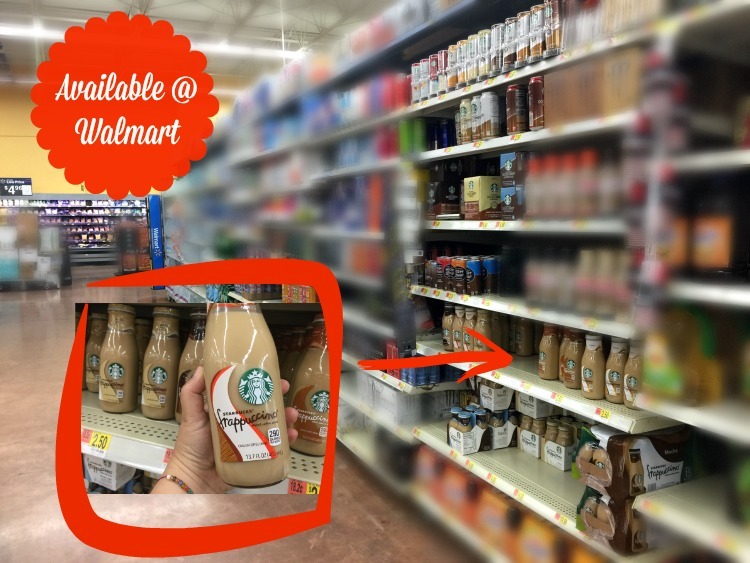 Shop at your local Walmart for this refreshing NEW Starbucks® bottled drink! 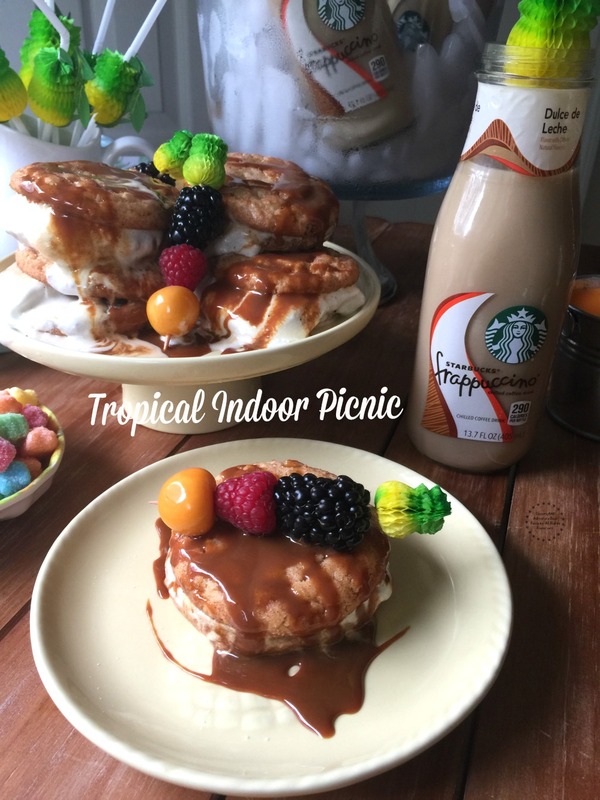 Throwing a tropical indoor picnic with las amigas to enjoy a good chatter and spend time together while sipping yummy Frappuccino® and eating sweet treats. 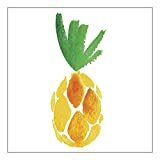 Graphique Watercolor Pineapple Party Napkins — 20 Soft Triple-Ply Tissue Napkins With Vibrant Orange and Green Painted Pineapple, 5" x 5"
Never thought of organizing an indoor picnic, what a fun idea and I loved your theme with all the carefully sourced products. Lovely pictures too, with so many vibrant colors! Oh!! It is so HOT here today! An indoor picnic is probably the BEST idea ever! I don’t know why the parks are so full when the weather is SO hot! I’m joining you on this indoor picnic party!! WHoa baby! You have some lucky friends!! The food looks amazing! Great idea, I’ve never thought to have an indoor picnic. Oooh these look yummy! I know a few people who would love it! Thanks for the idea! I have had indoor picnics with my kids before, but it hadn’t occurred to me to have one with adults – now my mind is racing with fun ideas! And I’m a sucker for those Starbucks bottled coffees myself, so I’ll be heading out to pick one up and try it in a little bit. My favorite is the mocha but now you’ve got me curious about the dulce de leche, too. A wonderful idea and so unique. I love the different tastes and colors you have put together. Gosh I love Starbucks Fraps. They are definitely something I grab when I can’t have my usual morning coffee. I didn’t realize that Florida has what we consider a monsoon season. I love that cool day those summer rainy days bring. What a fun theme for party. Actually this is best idea in summer. My kids love to have indoor picnic with fun and delicious food! Your pictures are very good! What fun that picnic looks! I have seen that flavor coffee here in Kentucky, I may have to buy it next time and try it! The food looks great for an indoor picnic! It’s awesome to have friends over especially during the summer and just enjoy some good company and good food. These are lovely ideas! This is actually a really cool idea. I live in South Florida and can absolutely relate to the weather canceling plans. I may try an indoor picnic. I used to have indoor picnics with my siblings when I was a kid. I will have to remember to do this with my kiddos on a rainy day! 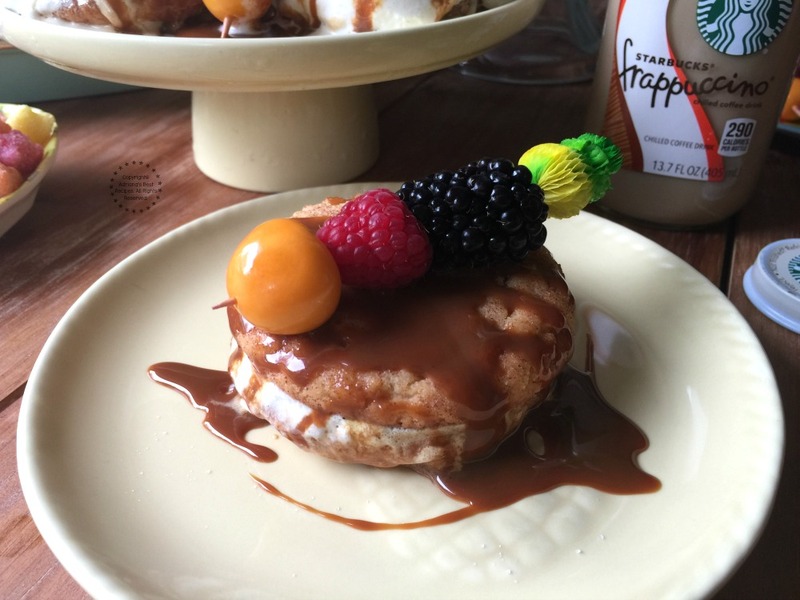 This dulce de leche Frappuccino and the ice cream sandwich look like a match made in heaven! With this crazy hot heat, an indoor picnic sounds like the perfect idea. I saw a video on facebook of this yesterday and just had to stop by to tell you how creative this tropical picnic party is. I bet this would be a big hit this summer! What a fun creative idea to host an indoor picnic. I do host a lot of girls night in but never did an indoor picnic. I’m so loving those cute fruit skewers and the cookie sandwich along with Starbucks Frappe. I can totally see you’ll thoroughly enjoy the whole picnic experience. What a sweet picnic with bestfriends! That will be perfect while watching favorite movies! an indoor picnic with friends! yeah, i think it’s the best time to have one in this very hot summer days. bottled capppucino coffee drink is a must.. I would love to join this picnic, can l come? 🙂 With all that yummy and colourful stuff, it’s hard to say what to eat first. A great idea for sure! Oh my, how fun is this! I want to do an indoor picnic. I seriously love this idea, maybe with my niece and nephew. Great ideas you have here. I love Starbucks and frappuccino is my fave when its so hot out! I can imagine that an indoor picnic could be lots of fun. I didn’t know they made a dulce de leche flavor, I might like that. What a cool idea and a great way to gather friends in a hot and humid day. Those ice cream sandwiches are wow! Living in a condo, I always plan indoor picnics! 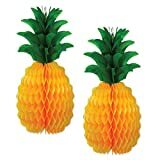 I love your table setting is so cute and so in the mood for the tropics! Indoor parties are awesome! I love the idea and it’s definitely something that I wouldn’t mind hosting. It’s important to have a good, refreshing drink too! Especially with the Florida weather. Perfect! I love the fruit kabobs, and I’m always up for Starbucks. I love the Dulce de Leche kind. I get that one alot. Your presentation looks amazing! And I haven’t seen that Starbucks drink yet!! I hope we get it here soon!!! What a fun idea! 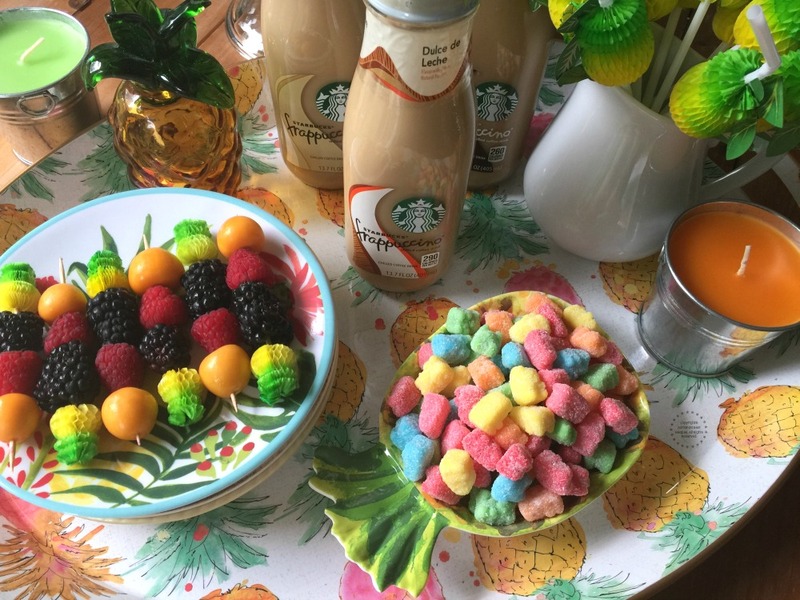 I love the pretty decorations, the colorful food and, of course, the Starbucks! That calls for a celebration in itself! LOVE Starbucks Frappuccino drinks! This looks like the perfect way to incorporate them into a party. Umm. Can I come over? This looks so good and I never thought of an indoor picnic idea! I love it! Also, I had no idea there was a Dulce de Leche flavor from Starbucks available in bottles! That’s my FAVORITE flavor when I order at my Starbucks! Oh Lordie, I wish I were one of your best friends!!! This looks really fun and tasty. Hope you gals had a blast! A tropical indoor picnic sounds wonderful. You have my sweet tooth up and ready to go.